The bigger of the two packs is the 35 litre Akra. The exterior is aesthetically very clean with the only features on show being the material water bottle holder. I understand the use of a different material here but personally, I would have liked to see this in the same colour as the bag itself. The water bottle holder itself also contains a zipped hidden pocket useful for cards or other travel related items. Other than a zipped front pocket and a fleece lined top pocket ideal for your sunglasses the only other items on show are the top carry handle and the straps. The Akra also features an optional detachable hip belt which also contains zipper pockets should you need them. The main compartment of the Akra opens fully giving easy access for packing. Compression straps will help you keep your items, or packing cubes, secure and you can also access the front pocket from the inside of the main flap — which is a nice touch. 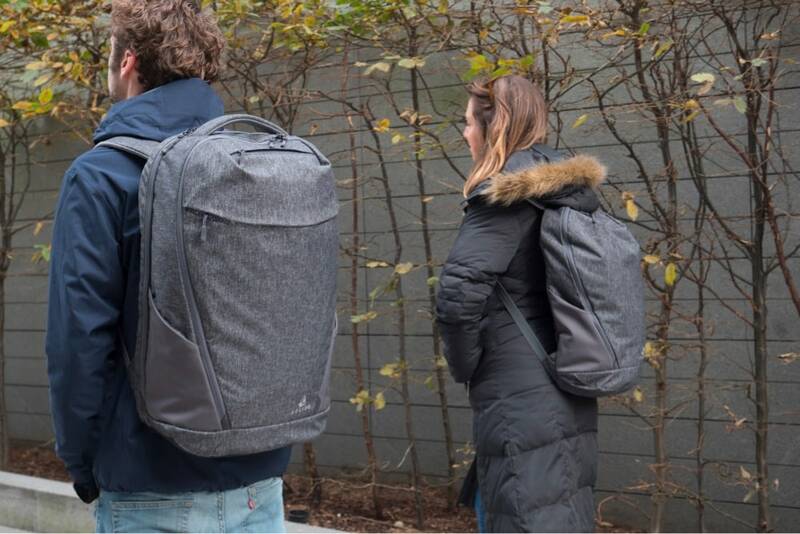 Flip the bag around and the rear panel features more pockets for your everyday carry items and the rather ingenious laptop harness. Designed for up to 15.4” laptops the harness stores your laptop in a removable suspended harness. This suspension keeps your laptop’s protected in the nasty eventuality of dropping your pack on a hard surface (which I am sure we have all done). The harness also fits inside the Vaga for day-mode use too. Carry-on obsessives, like myself, will also enjoy the secure rear facing passport slot, lockable zips, magnetic clasps, and the ventilated back panel. Currently retailing for £149.00 GBP the Akra is up there in terms of functionality and style with packs like the Peak Design Travel Line and the Nomatic carry-on range. That said, items like the laptop harness and hip belt will cost extra. The Vaga is the smallest, and lightest, pack in the Arcido range and is recommended for everyday carry use. It uses the same materials as the Akra and is designed to be used with the transferrable laptop harness. It also has a fleece-lined top pocket (like the Akra) and an inner mesh pocket for smaller items. The straps, whilst less padded than the Akra, look perfect for the size and load of the bag. It’s also the perfect fit for packing into the main compartment of the Akra giving you bag-in-bag flexibility. It’s unclear from the site how much space packing the Vaga will leave for clothing but I suspect it will be plenty for a couple of days away — if not more! Currently retailing for £69.00 GBP it’s at the pricier end for a packable day pack but then I would argue it’s at the higher end of the spectrum for a day pack. If you don’t currently own any carry-on luggage these two look like a great place to start. Well made, plenty of storage, some nice hidden features and priced competitively. Better still take advantage and buy a bundle. At the time of writing, you can get the Akra, Vaga, washbag, shoe bag, and packing cubes for £220.00 GBP. I’d also recommend grabbing the laptop harness for a total of £235.00 GBP (shipping is free). More information on both packs can be found on the Arcido web site.